Does work always take longer than you expect it will? You make a commitment or plan a task, and it always takes twice as long as you thought it would? I became more aware of this when I had a daughter. Just getting out the door in the morning suddenly took ten times longer than before. But I’ve also noticed this is the case with many other things. Perhaps it’s my optimism that causes me to think I can complete a task so quickly. But it always takes longer than I expect. For example, I recently needed to create user guides for a software solution. When I agreed to write them, I imagined myself creating the documents quickly and easily. The real story was different. Walking through the software took longer than I expected due to distractions and other commitments. It seemed to take me ages. And it’s this way with many things at times. You want your work to be high quality. But sometimes you just need to get it done. There are times when you just need to get things done more quickly. Thinking through tricks and tactics, I came up with eleven tactics to help you work faster. Collaborate. Focus on the part of the work that you’re good at, and work with others to complete the rest. My friends Jenny and Sandy at Namastream have a system for writing their articles. Sandy writes the initial draft and passes it to Jenny, who works it from there. They focus their strengths in the right areas where they’re most efficient. Identify the minimum. Don’t do more than necessary. Don’t spend time creating something more elaborate than it needs to be. Use a timer. Use a timer and strive to get the work done within that timeframe before the timer goes off. Don’t strive for perfection. Strive for DONE. Change location. Sometimes it helps to work in a different place than you’re accustomed to. If there are distractions or you can’t focus, try working in a different location. It may be somewhere you can’t settle in and get comfy or a place with fewer people you know or less access to you. I’ve written about this in another article on ways to quickly get focused. Break your work down into smaller tasks. If your work seems overwhelming and difficult to start, break it down into small tasks that you can complete more quickly. For a blog post, I’d have smaller tasks such as create an outline, create a title, write a rough draft, etc. Each of these can be completed independently and quickly, and then I can quickly move on to the next. Set a deadline. 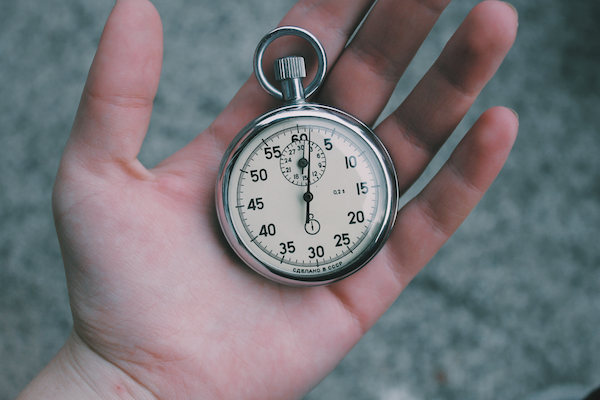 Create a sense of urgency by setting a short deadline for yourself. If you have a deadline you build in the motivation needed to stay focused and get it done. Make a commitment. Tell someone that you’ll deliver the work by a certain date/time. If someone else has an expectation, you’ll feel compelled to meet it. Say No. When you’re in your timebox or have your timer going, don’t let anyone pull you away with small requests. Someone stopping by to ask you a quick question can completely derail you. Stay focused and say no to those interruptions. Log your time. This sounds crazy and tedious, but it works for me. If I’m having trouble staying focused or not moving forward quickly enough, I write down what I’m doing with my time. I act as if I’m being billed for my time and track it as I go through the day. If I need to finish a document by the end of the day, I keep track of all the things I’m doing through the day to keep me focused. Ask yourself “Does this activity move me towards my goal?” This is my current strategy with social media. I find that it’s easy to get distracted by so many apps. If I’m looking at my phone or computer, I ask myself “does this add value and move me toward my goal?” If I’m doing research it may apply to my work. But if I get distracted by Pinterest or a news story, I’m no longer working toward my goal. Not all work needs to be done fast. But there are times when you simply need to put your head down and get it done. These 11 tactics will help you drive forward on completing a task or focused work more quickly. Do you have a favorite? If you have any others, add them in the comments below. I’d love to know more!